It is always a highlight to get invited to events of the most famous cosmetic brands of the world. Just recently I returned from (another) Estée Lauder event. I am so impressed how spectacular those happenings are organized - VIP entrance with a long blue carpet to the club Aura, beautifully and genoursely decorated, and of course everywhere a lot of top cosmetics, tables for make-up artists, mirrors... It was just breathtaking. The event started with a workshop, presented and lead through by the well-known stylist Blair Patterson, who was coaching makeup artistes around the world and was flown in from New York for us. I would love to share with you his beauty tips, but I do not know if I may, because they are super secret. But if you won´t tell anybody... For example, if you want to have the perfect foundation, layer it first. It lasts longer. Remove excess-makeup gently with a napkin, which will absorb it fast. Also try the latest makeup – the Cushion Stick Radiant Makeup, which was co-developed by Blair himself and it took the team two years for the final result. The review of this product is coming soon. Another tip. For smokey eyes it is sufficient to use a black pencil mixed with a little amount of makeup. Do not apply it on the entire lid. Leave a bright spot in the center, that you achieve a reflection effect. Anything you do to your skin needs training. It is no different with smokey eyes. But don’t give-up you will learn it. It is certainly not unmanageable. Next tip. For strobing use highlighter in powder. Last one. Stop to wet the applicators. A perfect skin hydration assures Advanced Night Repair that you apply with a small sponge on the foundation. After one hour workshop, it was time to refresh ourselves by a glass of champagne of Moët&Chandon. Soon the presentation of the latest autumn and winter 2016 beuaty products was starting. I can not wait. Do you know the best feeling? Curiosity. Impatience. A great joy when you see all the news that you can touch, smell them, try them and to imagine that they are all here just for you. In some products, I immediately fell in love with and they will accompany me through the entire autumn. Estée Lauder campaigns are always incredibly generous. In my opinion there is no other brand that could compete with them. Definitely, I will publish and write all about these great new products soon. I also should not forget the haute cuisine dinner we got served with. Finest fingertips, most of them I did not even know the name, anyway, they looked great and tasted even better. All in all a top event made by a top company with top products. Len nedávno som sa vrátila z (ďalšieho) Estée Lauder eventu. 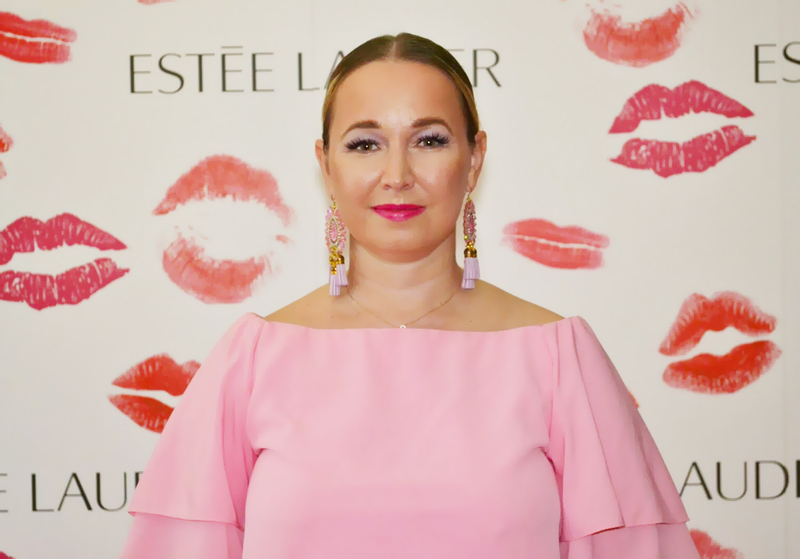 Ako to už býva, Estée Lauder event bol veľkolepý - VIP vstup s dlhým modrým kobercom do klubu Aura, kde sa event konal, krásne vyzdobené miestnosti, všade veľa kozmetiky, stoly pre vizážistov, zrkadlá… Dychberúce. Event začal workshopom za účasti vizážisty Blaira Pattersona, ktorý trénuje makeup artistov po celom svete a ktorý kvôli nám priletel až z New Yorku. Veľmi rada by som sa s vami o jeho kozmetické tipy podelila, ale neviem, či smiem, pretože sú super tajné. Ale ak to nepoviete nikomu… Tak napríklad, keď chcete mať perfektný makeup, vrstvujte ho. Vydrží viac a dlhšie. Prebytočný makeup vsajte do servítky jemným prikladaním na pokožku. Vyskúšajte najnovší makeup – Cushion Stick Radiant Makeup, ktorý pomáhal navrhnúť sám Blair a trvalo mu to dlhé dva roky. Recenzia bude čoskoro. Ďalší tip. Na smokey eyes vám postačí čierna ceruzka zmiešaná s trochou makeupu. Nezamaľujte celé viečko. Uprostred zanechajte svetlé miesto, ktoré akoby odrážalo svetlo. Čokoľvek, čo robíte na pleti chce tréning. So smokey eyes to nie je inak. Ale dá sa to naučiť. Určite to nie je nezvládnuteľné. Na strobing používajte rozjasňovač v púderi. Stop mokrým aplikátorom. Perfektnú hydratáciu pokožky vám zaručí Advanced Night Repair, ktorý aplikujete s malou špongiou na makeup. Po hodinovom workshope, je čas na osvieženie. Vhod príde pohár šampanského Moët & Chandon. Čoskoro sa začne prezentácia noviniek na jeseň a zimu 2016. Neviem sa dočkať. Viete, čo je najlepší pocit? Zvedavosť. Netrpezlivosť. A veľká radosť, keď vidíte všetky tie novinky, ktorých sa môžete dotknúť, privoňať k nim a vyskúšať a k tomu si predstavte, že sú všetky len a len pre vás. Do niektorých produktov som sa okamžite zamilovala a budú ma sprevádzať celou jeseňou. V Estée Lauder sú neuveriteľne štedrí. Nie je značka, ktorá by im konkurovala. Určite pre vás napíšem veľkú recenziu. A prezradím vám, že sa máte na čo tešiť. Nesmiem zabudnúť na haute cuisine večeru. Podávali sa jedlá, z ktorých väčšinu ani neviem pomenovať a ktoré vyzerali skvele a chutili ešte lepšie. Na takovou akci bych take rada zasla!